I am extremely excited about today's post! I have a new and interesting indie polish to share! And I know how much you (and I) love the indies! I think you will love the interesting part about this company! At NAYLL, we have put together a massive list of unique proven ingredients that is growing all the time. Now in one place you can have access to more options than you could have ever imagined. We've done all the hard work for you so you can be free to do the best part, DESIGN WHATEVER YOU CAN IMAGINE! In Southern California, there is a place with more flavors of nail polish ingrediants than you can imagine. Literally unlimited variations and combinations to push your imagination. I’ve got the glitter, I’ve got the colors, you’ve got the power to make it all from scratch. Oh, and I’ll do the clean up. This website offers you the opportunity to take control of what you put on your nails. Here, there is no team of invisible experts sitting around a big table telling you what is hot, what is not. What do they know anyway? Here, you got OPTIONS. Every color and shape of full-on bling you can think of is at your fingertips. Today, we tell THEM. Start with your base and feel free to lose control. Put in colors and styles. Get glitters. Get wild. Click whatever you want, ‘cuz you’ll want whatever you click! NAYLL is not just a custom polish company. They also create their own collections. I highly suggest taking a look at these collections! There are some real beauties! For my review I picked two NAYLL creations and made three customs. I also received the Holy Holo Top Coat and Smooth It Out Glitter Top Coat. First up are the NAYLL creations. Here is two coats of Crazy Eyes. CE is a beautiful blue jelly-ish polish. When I began the application I was worried that I would have to apply three coats. I stopped at two and liked the look. There is some VNL, but on my nubbins it isn't that bad. You might choose to apply three coats based on your preference. And yes the entire time I worked with this polish I thought of Crazy Eyes on Orange is the New Black! I applied one coat of Holy Holo to the top of CE. The coverage with with top coat is amazing and so is the sparkle! I loved what it did to the creme, I didn't want to take it off! The last NAYLL creation is Crystal Lagoon. I applied one coat of this stunning glitter over CE. There is no fishing with this glitter. In my application I did more of a swatch and dab. Once the glitter was on my nail I dabbed it into the position. This gave more of an even coverage. I also applied one coat of Smooth It Out, which did a fantastic job of leveling everything out. The first polish I created is a take on my favorite flower and theme of my blog. I went with a coconut jelly as the base and added green and yellow circles and silver holo glitter. I tried to apply the glitter without a base but it is so glitter packed it wasn't a smooth application. I decided to use a white base and things went much better. Still it is a tad thick and I had to do the the swatch and dab because there is so much glitter! Here is once coat of Daisy Dots over butter LONDON Cotton Buds. I also applied Smooth It Out but I was still a little lumpy from the large circles. I really want to love this creation but I don't think I picked the right mix of glitters. It is a love/hate relationship! My next creation is one I called Happy Hands because the glitter mix made me smile while I was creating it. I went with a clear base and added blue circles, pink squares, yellow dots and gold holo. Again, absolutely no fishing with this glitter! I swatched and dabbed over Don't Bossa Nova Me Around and had amazing glitter placement. I love this creation! It looks so soft and elegant, yet is also fun! There was no way I could pass up the chance to make a custom Doctor Who glitter. The idea for this glitter came from my favorite Doctor Who fan art. I basically picked glitter colors that match the image. I started with a blue jelly (of course), and added blue squares (for the TARDIS), orange, pink, turquoise, gold and silver glitter. I was worried that it wouldn't look the way I wanted but it is so much better! I absolutely LOVE this glitter mix. I couldn't call this anything other than All of Time and Space! I applied one perfect coat over essence black is back. I was going to do a blue base but I had to try it over black, and it is breathtaking! One coat of Smooth It Out was all I needed to literally smooth it out! Creating these NAYLL customs was so much fun! Setting up a company to let people create their own polish is fantastic! I thoroughly enjoyed this experience and the products! You can customize your own polish by visiting NAYLL. There is a tutorial video if you need assistance, or you can jump right in and start creating. You can start with a shimmer or glitter base for $8.00 and the price will go up for each glitter you add. I do suggest you check out the tips page before starting. Don't forget to take a look at the NAYLL collections! These are nice! I really like their glitters, its fun! 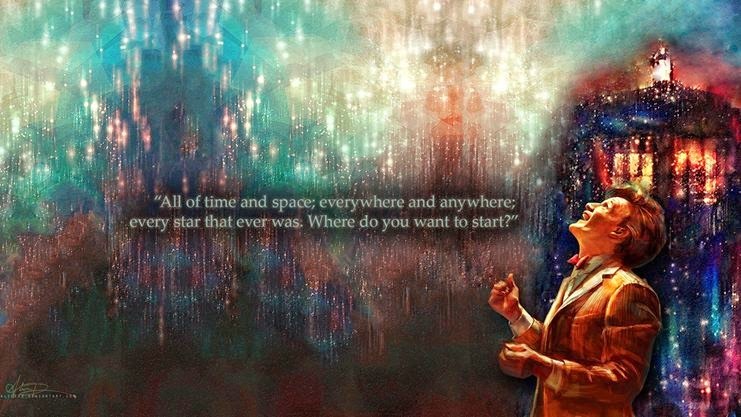 All of Time and Space is AMAZING. All of Time and Space is gorgeous! I love the inspiration and the polish itself!